Beautiful Avista Resort 3 bedroom condominium located along Ocean Drive in North Myrtle Beach. Enjoy the Ocean Drive Difference by starting your vacation immediately upon arrival, as this property comes with fresh bed linens/bath towels, the beds are already made up for you, and the departure maid service are all included in your price. This unit has amazing views from two of the three bedrooms, and you'll also love the ocean and beach views from the balcony and living room. The beachy, bright and colorful interior decor adds cheer to your vacation, while the fully equipped recently renovated kitchen in 2018 and has everything you need to prepare your meals, cool drinks and hot coffee! With two private baths and a third hall bath, privacy and bathroom access won't be a problem. Watch family and friends from the low-floor balcony as they play in the pool or on the beach strand. 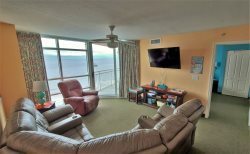 Amenities include a TV in each bedroom AND living room, DVD player, WIFI internet access, stacked clothes washer/dryer in unit, dining area with full dining table and breakfast bar seating for 4, and a large oceanfront balcony with access from the living room and two bedrooms. There are plenty of pool and hot tub options, with an exercise room, and on-site restaurant all available to Ocean Drive Beach Rentals' guests staying at the Avista Resort. While vacationing at Avista 210, you'll be in close proximity to the hot entertainment options of Ocean Drive in North Myrtle Beach. There is plenty to do close by, from shopping and dining to popular attractions and golf. Myrtle Beach attractions are just minutes away!